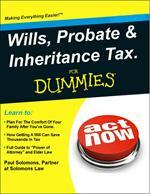 A Will is about what happens to your finances, possessions and dependents when you pass away. It’s vital that you have an up to date Will that takes your personal circumstances into account. If you pass away without a Will (you die Intestate) and everything is given away according to fixed intestacy laws. But if you have dependents or children it's even worse. Children could end up getting nothing. And your children could end up in the care of social services if a parent has not made a Will appointing a guardian. (Tragically this happens sometimes if both parents die in a car accident for example). Fixed intestacy laws don't take into account how you wish your money and possessions to be divided out or how to look after your dependents. It is hard to imagine the unnecessary confusion and distress caused when people die without making a Will and these circumstances are often an ideal breeding-ground for family disputes. There’s no better way of organizing your Will than getting a Solicitor to write it for you. Just to let you know I am a member of the Society of Trust and Estate Practitioners (STEPS) and a recognised Inheritance Tax expert. I can also help you choose your Executors (or act as one of them). There's a whole lot of information about the whole process of what is known as “Probate” and I will professionally and ethically guide you about what happens when you pass away. And most importantly, please, please get a decent Will, written by a specialist family solicitor. Even if Solicitors in Bournemouth don't organise your Will and you go on to get a Will elsewhere, I will still consider it a job well done by me. Likewise, if you want me to expertly review an existing Will, I am more than happy to do this for you. Prince Charles Gets The Money From Those Who Die Intestate and Reside In Cornwall. There are many ancient laws when it comes to Wills and Inheritance. It was recently revealed in the Daily Mail that Prince Charles' Duchy of Cornwall estate has received more than £1 Million of assets from people who have died without making a will. Prince Charles has always decreed that this money be given to charity. But how many people die every year and see their hard earned assets and money go to the State? Too many in our view. Dying intestate, (without a valid will) is terrible for the family, friends and others, who are often powerless to carry out wishes of the deceased, all for the lack of a bit of proper planning. Pablo Picasso died 1973, aged 91. Assets included artwork, multiple houses, cash, gold and the rest. Dying intestate meant six years of legal fees at a whopping $30 million. Six heirs received his assets. Howard Hughes, a handwritten “Mormon will” turned out to be a forgery and the man who made billions of dollars had his estate divided up between twenty two cousins. "Sonny" Bono, member of US Congress and the other half of Sonny and Cher, died whilst skiing in 1998. He died without a will and his widow Mary Whitaker, who he married in 1986, became the estate's administrator. Jimi Hendrix, the singer/songwriter never got round to writing his will. Probably too busy writing some of the greatest music (in my opinion) ever made. Other famous people to die intestate include; Princess Diana, Barry White, Bob Marley, Jill Dando, Heath Ledger and Natasha Richardson. To avoid what famous people do, maybe give us a call to get your will sorted out by Solicitors In Bournemouth. Can’t Take It with You was a series on BBC2. Its theme was about people dying intestate, (without a Will) and the problems that it causes. Many people who are basic rate taxpayers amass more assets than the £325,000 Inheritance Tax threshold (double that for married couples and civil partnerships) and end up paying 40% on their estate when they die. The programme talks about the taboos that surround death and retirement planning and how many families never get to talk about the inevitable, death and taxes, never mind actually planning for it. With so many middle-aged people relying on their inheritance from their parents to help secure their financial security, it makes sense to plan for this before elderly parents enter a period of mental incapacity or residential care. People are often put off by confronting the reality of death. But making a Will means that you can make your wishes clear at the same time as reducing Inheritance Tax. It can also reduce the likelihood of any litigation from disgruntled heirs, divorced partners or new partners. If you want any expert advice on Wills, Estate Planning, Trusts or Inheritance Tax from Solicitors In Bournemouth please get in touch.